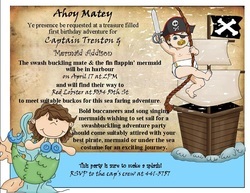 With birthdays 2 days a part, we planned a party together - pirates and mermaids. It's a shiver me timbers good time. We threw the party in the back seating area of our local Red Lobster. That made the decorating a snap.